On any given weekday morning, the scene looks much like any popular diner or favorite breakfast spot: a line forming around the corner, the smell of toasting bread and griddling eggs, people inside milling about and chatting with one another while enjoying a hot breakfast. “I see it sometimes when I’m downstairs—the people smiling, the kids eating. It’s filling a need,” says Kelly Barkley, Development Manager of New York Common Pantry. The need is startling: one in six New Yorkers – that’s nearly 1.4 million people— is food insecure. When “the Pantry” (as the organizers and their customers call it) started more than 30 years ago, Barkley says it was a “temporary” response to hunger on the Upper East Side. They fed 30 families. 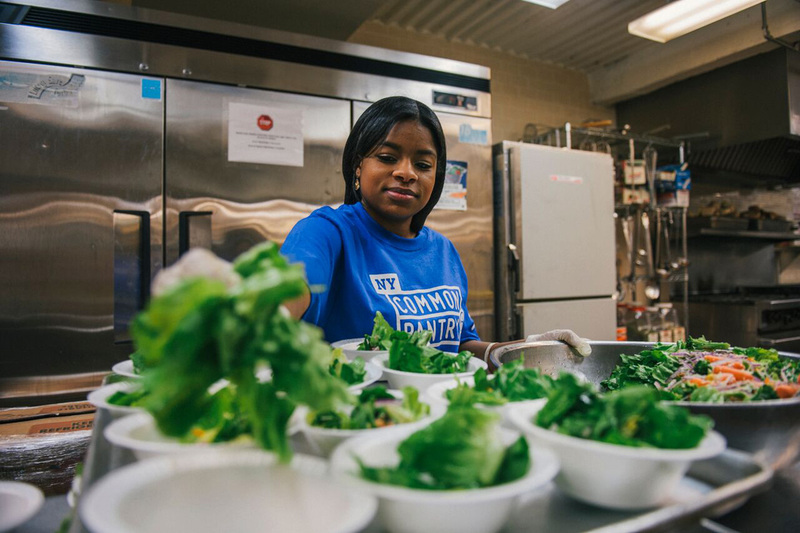 More than three decades later, the Pantry is serving more than 2.9 million meals to more than 300,000 people just last year. 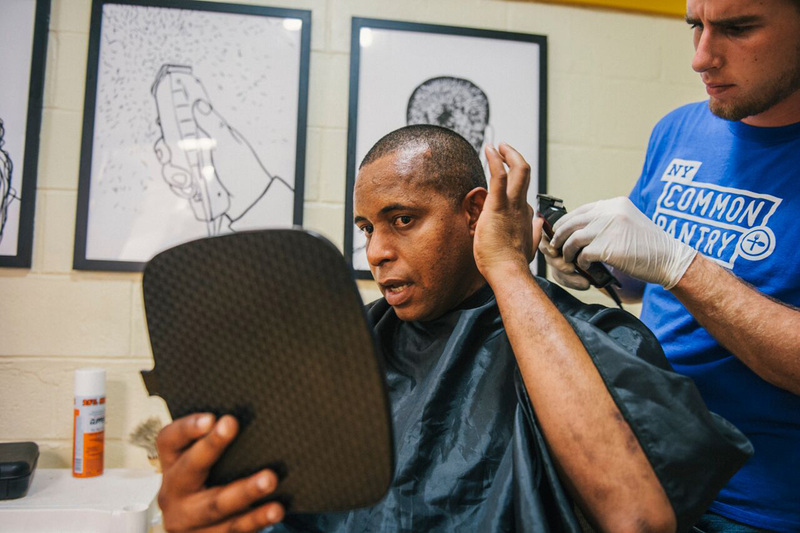 “We have since expanded our mission to serve all of New York City,” Barkley says. What makes the Pantry stand apart is its approach to battling hunger. It goes beyond providing people with meals and basic hygiene services. “We take a ‘whole-person’ approach,” shares Barkley. That approach is Help 365, the Pantry’s program to collaborate with social services and connect members with assistance programs and employment referrals. Additionally, the Pantry offers nutrition education to teach people how to choose and prepare healthy meals themselves. What does it mean to be food insecure? The term itself is not necessarily synonymous with homeless, poor or starving. Food insecurity simply means there’s not enough food to support a healthy, active life for everyone in the home. While some people rely heavily on the Pantry for food every day, others may only need help once in a while. Many people who visit the Pantry are employed. “The stories that most stick out to me are the ones of people who are working and come to us because they still need an extra bit of assistance,” Barkley says, sharing the story of a woman named Michelle, who, after working at a hospital for 17 years, fell victim to an illness that left her unable to work. At the Pantry, she could choose her food, including fruits and vegetables sourced from local New York state farms. While most companies pride themselves on their ability to retain customers, the Pantry measures a job well done by the clients it lets go—because they no longer need the extra support. According to Barkley, 68 percent of families are able to reduce their visits to the Pantry after one year. That’s more than 200,000 people each year who are one step closer to making it on their own again. U.S. Navy veteran and mother, Halana, is one Pantry customer who never expected to need the help. She was happily married and living the life she had always dreamed. Then came the day she describes as “when the sky fell.” Her husband was robbed and killed, then months later, things became worse. “I was laid off from my job. I couldn’t afford food or rent. I was terrified,” she says. Then another parent from her child’s school told Halana about New York Common Pantry. For Halana, the Pantry did more than just provide her with food to get by—it turned her life around. The Pantry has since enrolled Halana in a food stamps program and signed her up for cooking classes that she says not only help her stretch her ingredients, but are also therapeutic. While Halana still has healing to do, she’s getting back on her feet; she’s working multiple jobs and plans to enroll in college. “When I needed help, they [the Pantry volunteers] were there with open arms and kind hearts,” she says. With nearly three million food insecure New Yorkers to serve, the Pantry relies on partnerships with local businesses and organizations to help them with food supplies, medical screenings and legal assistance. “Healthy proteins are the biggest food expense at dinner time, and knowing that we’re receiving high-quality chicken from Chick-fil-A will help us ensure that we are able to feed more hungry New Yorkers,” says Barkley.